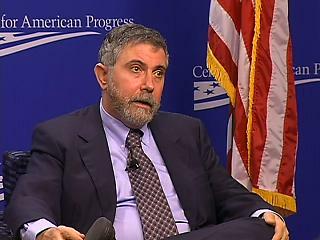 Nobel prize winning economist Paul Krugman has advocated for a Tobin tax. The Austrian government estimates that the tax could raise £420bn a year. Nobel prize winning economist Paul Krugman has added his name to the list of Tobin tax advocates. The Austrian government estimates that the tax could raise $700bn (£420bn) a year. “On the claim that financial transactions can’t be taxed: modern trading is a highly centralized affair … while traders are all over the place, a majority of their transactions are settled — i.e., payment is made — at a single London-based institution. This centralization keeps the cost of transactions low, which is what makes the huge volume of wheeling and dealing possible. It also, however, makes these transactions relatively easy to identify and tax. Meanwhile a report published last week by Compass, ‘In Place of Cuts’, urges a domestic financial transaction tax of 0.1 per cent on all payments in bank accounts. It is estimated that this could generate £4.2 billion. I think this kind of redefines the word “Chorus” but good story none the less. When one actually stops to consider that the UK borrowed £11.4bn in October, 2009 and that this country will run a budget deficit equal to 13.2pc of GDP next year – the biggest fiscal shortfall of any major economy in the world and the biggest in our peacetime history. Then with the Government borrowing £200bn annually for at least the next three years leading to the UK’s national debt ballooning from 44pc of GDP to more than 100pc by 2014. With these sobering facts to consider, even the piddling £4.2 billion Compass thinks it would raise would be a start – especially since the report Will takes this from states they (Compass) would like to reintroduce the 10p tax band which I support fully. Good stuff…. Please do get it right. It’s not an Austrian Government report. They are a private sector think tank. Am I the only person in this country who actually went and asked them the question? “WIFO is – as you would say in English – a privat sector think tank with a focus on empirical economic research. Then you might try actually reading the report to see the assumptions they make. Highly dubious ones. Like, for example, the idea that we could raise £100 billion here in the UK alone. Seriously? We can get more tax out of the City than their entire contribution to GDP? Even in your socialist utopia surely you cannot envisage every country in the world agreeing a punitive tax on finance.